Our standard vinyl binders with added fold-over flaps on the front cover and Velcro closure keep contents secure. These handy binders can be constructed from a wide variety of materials. Sheet Sizes 11 x 85 and 8.5 x 5.5 to Available in all standard sheet sizes. Snapper Binders may also be made using turned edge, poly or paperboard construction. Are you looking for a binder that can safely store your papers? Then Ad Industries’ Snapper Binder is the optimum solution for you. Our binders provide protective and easy-to-use storage solutions. Now misplacing documents will be a thing of the past. These binders are designed with a flap that closes over the cover that helps prevent the binder from coming open while transporting. The flap can have either Velcro or plastic/metal snaps attached to both flap and front cover of the binder. The binders have optional multi- pockets and sleeves that allow you to easily store different types of documents or brochures – from notes and cards, to reports, proposals, and loose papers. We at Ad Industries design these binders using virgin vinyl as the primary materials. The binders feature front fold flaps of various sizes that typically use Velcro as a closing system. This allows you to open and close the binder without any difficulty. The front fold flaps also add another layer of security for your documents, preventing them from being easily removed or falling out from the binder. 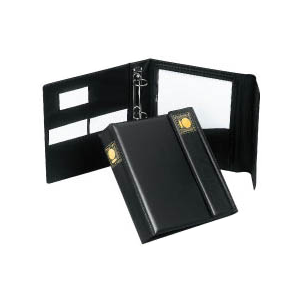 These binders are mainly designed for sales executives and people on the go. For this reason, we supply these binders with all the standard PVC colors vinyl. Our snapper binders are available in all standard & custom sheet sizes. They can also be made using turned edge, poly or paperboard construction. The snapper flap binder can be decorated with all standard vinyl techniques to include your company logo/brand. We can also coordinate the colors of the binder and print to match your company colors. Thus, our snapper binders not only make for safe storage devices, as well as great marketing tools.If you would like to know more about this product, please feel free to Contact us.